The subject of fish conservation is hotly debated and is often dogged by controversy, which makes it difficult for a fish restaurant to know how to do the right thing. 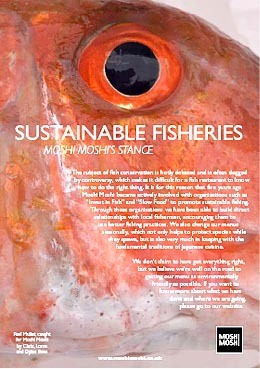 it is for this reason that five years ago Moshi Moshi became actively involved with organisations such as “invest in Fish” and “Slow Food” to promote sustainable fishing. Through these organisations we have been able to build direct relationships with local fishermen, encouraging them to use better fishing practices. We also change our menus seasonally, which not only helps to protect species while they spawn, but is also very much in keeping with the fundamental traditions of Japanese cuisine. We don’t claim to have got everything right, but we believe we’re well on the road to getting our menu as environmentally friendly as possible. If you want to know more about what we have done and where we are going, please take a look at the other environment pages on this site.